Use imlSoft CD/DVD Guard, to backuo your data onto a portable,secure disc. imlSoft CD/DVD Guard is a powerful tool to burn AES encrypted cd/dvd. Whatever information, files, folders and documents you put in your cd dvd drive, imlSoft CD/DVD Guard keeps them completely secured. 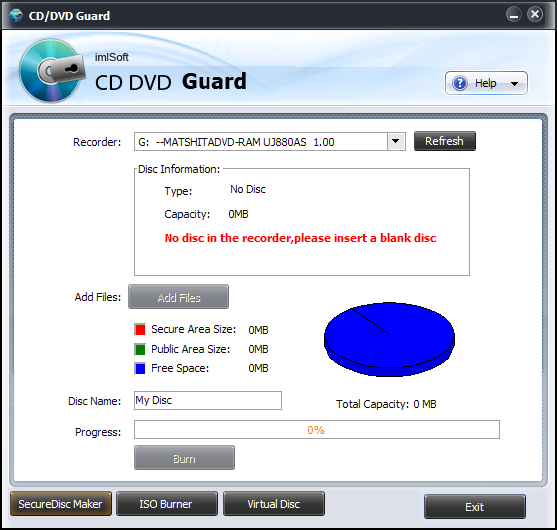 To view the content of encrypted disc made by imlSoft CD/DVD Guard ,you doesn't not need install this software. imlSoft CD/DVD Guard protects data using several layers of patent pending protection methods. The core technology is based on sector-level encryption. imlSoft CD/DVD Guard can make ISO format image file of CD or DVD. imlSoft CD/DVD Guard can burning ISO image file onto CD or DVD. Qweas is providing links to imlSoft CD DVD Guard 2.1.1 as a courtesy, and makes no representations regarding imlSoft CD DVD Guard or any other applications or any information related thereto. Any questions, complaints or claims regarding this application imlSoft CD DVD Guard 2.1.1 must be directed to the appropriate software vendor. You may click the publisher link of imlSoft CD DVD Guard on the top of this page to get more details about the vendor.